This is a guest post by Eric Rosenberg, a full-time freelancer and blogger at Personal Profitability. Eric writes about personal finance and entrepreneurship at InvestmentZen, his own blog, and other sites around the web. In April last year, I had my last day in corporate America. For the eight years before, I have been working online as a freelance writer, website developer, and consultant. That income grew enough that I thought it was worth taking the risk and quitting my job, but I still had some worries that it might not work out. On that fateful day last April, as I literally walked out the door and exited corporate America, I knew that if things didn’t work out that I would need a backup to earn a little more. Thanks to the growth of gig and sharing economies, I had a plan. 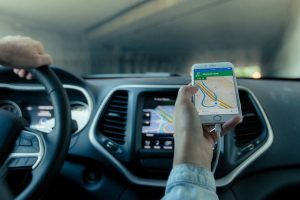 Read on to see how Uber, Lyft, and other gig and sharing economy jobs can help you navigate financial uncertainty or hardship. For me, Uber and Lyft were a financial safety net in case my new self-employed venture didn’t work out. I am a big fan of side hustles, and the ease of joining Uber and other delivery sites makes that a lucrative option. I never actually drove for a ride sharing or delivery service, but knowing that I could gave me peace of mind when I left my high paying job as a Senior Financial Analyst. If you want to become self-employed but want an extra safety net if things don’t work out, you can always hop in the car and make a few bucks. If you have a day job and still find yourself coming up short on cash when the bills are due, a gig economy job could be just what you’re looking for. You can make over $20 per hour if you pick a busy location during high demand hours. Maybe instead of going out on a Saturday night and spending money on drinks, movies, dinner, or something else, you could go out driving and bring in a hundred bucks or so. It’s worth a shot! Late payments on bills, particularly credit accounts, can lower your credit score. A lower credit score might not seem like a big deal today, but if you ever apply for a loan or try to buy a home with a mortgage, good credit is very important. It can save you tens of thousands of dollars in interest and might be the difference between an approved or denied application. Do you ever get depressed looking at your retirement account balance? Do you dream of a trip across the world but don’t know when you’ll ever have enough money? That is a perfect use for the gig economy. If you earn an average of $100 each time you go out driving and go out once a week, you can save up enough for a plane ticket to Europe in less than three months! Finance an entire $2,000 trip in less than six months. You can take a trip spending far less, but this example shows how easy it could be for you to make any financial goal happen. If you just want to save more, that $100 a week adds up fast. If you take a couple of weeks off each year, it is still enough to earn $5,000 per year just going once per week. That can fill your emergency fund, retirement account, down payment savings, or any other financial goal you’ve been working to reach. When I left my job, I walked away with enough savings to survive about five years without earning a cent, but I know that isn’t normal. Would be entrepreneurs around the country put off self-employment, starting a side business, or other money making ventures simply because they don’t have enough cash in the bank to cover startup costs. Jump onboard the gig economy and you will be in business in no time! If you can cut your expenses and spend your free time working on your new business. You know it won’t happen unless you act. So, what are you waiting for? As long as you own a car, you can start driving and earning money by downloading an app, entering your information, and tapping some buttons. How cool is that? In my case, my business has been quite successful and I never needed anything more than a couple thousand dollars from savings. But if I hadn’t had the option of driving for Uber, I might never have taken the risk to leave my job in the first place. And today, I’m happily self-employed, working from home, setting my hours, and working hard on building my brand. But I wouldn’t be here today without Uber. It may not be glamorous, but it is a great way to earn more. So if you have any financial stresses, consider a side hustle or a job from the gig economy. There’s no cap to how much you can earn, and there’s nothing standing in your way of big time financial success.